• Portland will conclude the regular season with a pair of home games at the Chiles Center will WCC Tournament seeding ramifications on the line. • The Pilots host third-place BYU on Thursday at 7 p.m., and then take on San Diego Saturday at 1 p.m. Portland and San Diego are currently tied for fifth in the league standings, one game ahead of both San Francisco and San Diego. • Thursday’s game will be televised live on ROOT Sports NW with Tom Glasgow and Jack Sikma on the call. • Saturday is the WCC Game of the Week and will air on Time Warner Cable SportsNet and ROOT Sports NW. Barry Tompkins and Casey Jacobsen will provide the commentary. • Thursday night is CYO night and all kids wearing their CYO jerseys will receive free admission. Regular game tickets start at $10 for kids and $15 for adults on Thursday. Saturday’s game is free for YMCA kids, while other tickets start at $5 for kids and $10 for adults. Visit PortlandPilots.com for more information. • Saturday will also feature the annual Halftime Paper Airplane Toss. The fan that comes closer to hitting the target at halfcourt will win a trip for two to Hawaii. • Saturday will also feature a free Kids Zone on the Chiles Center mezzanine. • The Cougars (21-8, 11-5 WCC) are on a four-game win streak and currently sit alone in third place in the WCC standings after posting a 75-62 win over San Diego in their lone game last week. • BYU is led by the NCAA’s third leading scorer this season, senior G Tyler Haws who averages a WCC-best 22.4 points per game. Haws is seven points shy of passing Jimmer Fredette as the school’s all-time leading scorer. • Head coach Dave Rose is in his ninth season and has a 243-83 record. • BYU defeated the Pilots by a 97-88 margin earlier this season in Provo. BYU getting hot at the right time with four wins in a row and six in their last seven...they're also desperately clinging to the tournament bubble and a loss for them tonight would be devastating. And the Pilots know that a win will clinch top six. Interested to see what Reveno does tonight in terms of game plan...BYU is such a weird team, they could get hot and hang with just about any team in the country. Close to zero production from the 4 and 5 spots, but they usually are able to manage that as a team. Monday night, Bill Johnson asked Rev how he'd like to play them. He said he'd like to run, but maybe that wasn't such a good idea. @CoachRev wrote: 1st time we played at BYU, tried to outscore them, came up short 88-97. Tonight need to defend their top 10 offense AND be aggressive on O. What's the over/under on the number Jimmer Jerseys I'll see tonight? It would appear that the games they have lost this year tend to be lower scoring than those they have won. Note particularly the 2 Pepp losses. Watched the first half and the first three minutes of the second half before TheW.tv went six feet under. Pilots were a confident, efficient team for the first 20 minutes...and sure looks like the exact opposite for the second 20 but I'll have to wait to see other reactions as I had to resort to score checks on Twitter for my updates. Biggest game of the year coming up against USD now...better win, or else the Pilots will need a Pacific upset over USF or a SCU upset over SMC. Not sure I see either happening. GU has claimed the #1 seed, and plays BYU Saturday. Both teams have something to play for; GU the #1 seed in the NCAA tourney, and BYU is desperate to get a NCAA berth... and probably needs at least 1 win over GU to get back in the NCAA bubble conversation. SMC gets the #2 seed with a win vs. SCU Saturday, and even with a loss unless BYU upsets GU. BYU gets the #3 seed, unless they upset the Zags and SMC loses to SCU. Pepp is locked into the #4 seed, and hosts a depleted LMU on Saturday. The winner of the Pilots vs. USD game gets the #5 seed. It gets interesting for the loser, who could end up in a tiebreaker quagmire with USF and SCU for the #6, #7 & #8 seeds. More on that below. Pacific and LMU will be 9th & 10th seeds Pacific plays @ USF. If the Pilots lose to USD, we hold the tiebreaker over SCU (season sweep), so the Pacific @ USF game is the one to watch. If Pacific wins, Pilots get the #6 seed due to a better record than USF. If USF beats Pacific, we would both end up with 7-11 records, and due to the season split, it comes down to results against the rest of the conference. USF has a season sweep over Pepp, while we have a split, so USF would win the tiebreaker, and the Pilots would end up with the #7 seed. If USD loses, they hold the season sweep against USF, and the Toreros have a win against BYU, so they would get the #6 seed if SCU loses to SMC. If SCU beats SMC, then SCU gets the #6. So, we need to beat USD. If we lose, we need Pacific to beat USF to avoid the Friday games. PORTLAND, Ore. – Portland led by eight at the half, but the BYU Cougars erupted for 49 second half points en route to an 82-69 victory Thursday night in West Coast Conference action at the Chiles Center. Kevin Bailey led the Pilots with 18 points, while Bryce Pressley had 16 – all in the first half. BYU senior guard Tyler Haws scored a game-high 21 points and passed Jimmer Fredette as the program’s all-time leading scorer in the first half. Skylar Halford added 19 points off the bench for the Cougars (22-8, 12-5 WCC) who have won five straight. The Pilots (16-13, 7-10) dropped their third straight game and will now look to secure the No. 5 seed and a first round bye in the WCC Tournament with a win in the regular season finale against San Diego on Saturday. Thursday night’s game was a tale of two halves as the Pilots dominated play in the first 20 minutes. Pressley was perfect from the field in the half, drilling all six of his field goal attempts including four three-pointers. The Pilots carried a 41-33 lead into the break after shooting 54 percent from the field and holding BYU to 34 percent. The roles reversed after intermission as the Cougars opened the half by scoring the first seven points. BYU took their first lead of the second half on a Haws layup for a 44-43 lead. The lead grew to nine, but the Pilots made it 64-62 on a Thomas van der Mars layup with 5:35 remaining. BYU answered with a three-point play by Halford, but Pilot freshmen Jason Todd would bring the deficit back to two at 69-67 with a three-point play of his own with 3:56 left. The Cougars then used 13-0 run to put the game away sparked by a Halford three and six points from Haws. BYU shot 55 percent in the second half and held the Pilots to 34 percent. Portland had 12 first half assists and zero in the second half. The Pilots were also unable to take advantage at the free throw line despite getting into the double bonus with 12 minutes remaining. The Pilots missed two frontend one-and-ones and were just 17-of-28 from the line for the game. Van der Mars, who earlier in the day was named a CoSIDA First Team Academic All-America, grabbed a game-high 13 rebounds and blocked three shots. He is Portland’s all-time leader in blocked shots with 115. BYU’s Kyle Collingsworth was the third Cougar in double figures with 15 points, 11 assists and six rebounds. 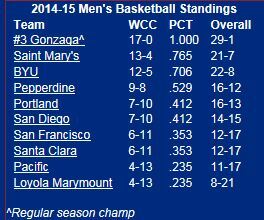 The Pilots now control their own destiny for a first round bye in the WCC Tournament based on Saturday’s outcome. Portland is currently tied with San Diego for fifth in the standings and a win would vault the Pilots into sole possession of fifth place and set up a quarterfinal meeting with No. 4 Pepperdine. A loss would put the Pilots into either sixth place (if San Francisco loses to Pacific) or seventh place (if USF defeats Pacific). The top six seeds receive a first round bye. Saturday’s game against San Diego will be the WCC Game of the Week and tips off at 1 p.m. Portland will recognize its six seniors as part of Senior Day approximately 15 minutes before tip-off. The game will be televised on TWC SportsNet, ROOT Sports NW and CSN Bay Area, while radio coverage begins at 12:30 p.m. on Sports 910 (KMTT). SHARP, Josh 0-0 0-0 0. Totals 30-68 15-20 82. SHARP, Bobby 0-3 0-0 0. Totals 23-51 17-28 69. Wow, tale of two halves. First half Pilots were the better team, and left points on the table; it could have been better. They opened up the 2nd half with two VDM TOs that set the tone. BYU got their hands on pass after pass, striped multiple balls, and played aggressive defense with many fouls. The Pilot response was to miss most of their FTs. Unbelievable.